Windermere lake, at 10.5 miles long, one mile wide and 220 feet deep, is the largest natural lake in both the Lake District and in England, and is fed by numerous rivers. Strictly speaking, Windermere lake is just called Winder”mere”, with “mere” meaning a lake that is broad in relation to its depth. However here, to avoid confusion with Windermere Village, we refer to it as Windermere lake. The long thin lake itself forms the central spine of the Windermere lake area of the Lake District. This area is also known as the South Lakes. Looking north from the foot of Windermere lake, with Fell Foot Park right, and Lakeside Pier left. Bowness-on-Windermere is Lakeland’s most popular holiday resort. An excellent centre for boating activities, it has over 10,000 boats registered. Until March 2005 Windermere was the only lake in the Lake District without a speed limit. A 10 mph limit has now been imposed. Steamers and launches operate from Bowness Bay to Waterhead at Ambleside, and Lakeside at the southern end. At the southern end of the lake is Lakeside Pier, and Lakeside Station of the Lakeside and Haverthwaite Railway. Another popular attraction here is the Aquarium of the Lakes. The only car ferry takes around 10 minutes to cross the centre of Windermere lake. It runs from Ferry Nab, just south of Bowness, to Ferry House at Far Sawrey and operates all year round. The lake is today one of the prime destinations for water sports in the Lake District. Several marinas and Sailing and Windsurfing Centres are to be found on the shores. You will also find a large selection of Adventure Activity companies, guides and instructors for all abilities based around the lake. Details of these can be found in our Activities Section. Arthur Ransome based his book ‘Swallows and Amazons’ partly on Windermere lake and partly on nearby Coniston Water. 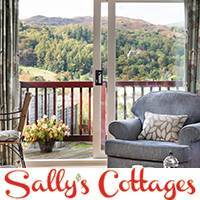 There’s a superb range of places to stay in the South Lakes, from camping and hostels to luxury spa hotels and holiday cottages. Private hotels and b&b’s are plentiful in the area. Yurts and shepherd’s huts are at Low Wray, near Ambleside, and Rydal. Wherever you choose to stay you will find a great selection of excellent attractions to visit nearby. And for the adventurous, the outdoor activity industry in the Windermere lake area offers almost every imaginable opportunity. Bowness-on-Windermere is on the east shore and the busiest tourist destination in the Lake District. Ambleside, at the northern tip of the lake, is also very popular with visitors. Newby Bridge at the south end of the lake is slightly less well known and consequently a little quieter. However it also has plenty of accommodation and attractions. It is connected to the lake cruises route via a short journey on the steam railway. Other popular visitor destinations around Windermere lake are the delightful Coniston, Rydal & Grasmere villages. These all have their own smaller lakes of the same names. Hawkshead, Sawrey and Troutbeck and the majestic Langdales are all close by. The Windermere lake area has been popular with tourists since the 19th century. Today, peak holiday times can see the main towns and lakes around Windermere thronged with visitors. However the region is well accustomed to this and is wonderfully relaxed and friendly, even on the busiest bank holiday weekends. In the South Lakes valleys around Windermere lake, narrow winding lanes are bounded with dry stone walls and hedgerows, meandering through deciduous woodlands. Gem like lakes and musical becks are overlooked by the southern fells and the lofty Langdale Pikes. In spring and summer, bird song fills the air and the rolling pastureland is dotted with sheep and lambs. During any prolonged period of good weather the rivers and lakes are easily warm enough for swimming near the shore. If swimming in deeper water be aware it is always cold. Wet suits are advised and always be accompanied by a small craft. Many of the local countryside sporting fairs, such as Ambleside Sports are held in summer. Autumn is also a very popular time to visit with wonderful natural colours in the forests and on the Lake District fells. This is also the season of many local food fairs. Winter is a wonderful season in the South Lakes with crackling log fires and real ale pubs after invigorating walks. 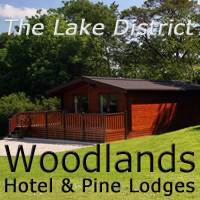 Many Windermere area accommodation prices are reduced for the off peak season and nearly all attractions and restaurants are open as usual. In Neolithic times (around 4,000 BC) the Langdales, near Windermere, was the centre of the stone axe making industry in the UK. Around 27% of all axes from this period found in the whole of the UK came from this area. There is archaeological evidence of settlement, farming and timber management for the building of houses and boats. The Romans built their fort of GALAVA at the lake’s northern end (Waterhead). For more than a thousand years it was an important waterway for movement of heavy materials. Influences through the centuries include the Vikings around 1000 AD, from whose language many Cumbrian words are taken. The Norsemen are believed to have introduced the Herdwick sheep to the Lake District. 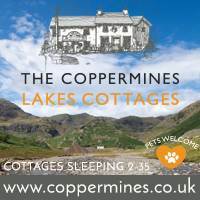 Copper deposits near Coniston attracted German miners to the South Lakes area in the late 16th & early 17th centuries. Many of them settled here and married into the local communities. By the end of the 18th century the beauty of the Lake District, and the South Lakes in particular, was attracting visitors. Wordsworth’s popular “Guide to the Lakes”, published in 1810, further promoted the Lake District as a tourist destination. When the railway reached Kendal in 1846, and Windermere in 1847, visitors flocked to the South Lakes. The village of Windermere grew around the Windermere railway station, about a mile and a half from the lake. The village was originally called Birthwaite, but the railway company decided to call the station after the lake and the village name also changed. In the late 19th century, wealthy businessmen from Lancashire built grand mansions overlooking the lake. Many of these have now been converted to hotels, such as the Langdale Chase Hotel, and the Belsfield Hotel. Others houses from this period include The National Park Visitor Centre at Brockhole, between Ambleside and Bowness. Wray Castle, almost opposite Brockhole, was the first Lake District holiday home of Beatrix Potter. In 1951 the Lake District National Park was established, encompassing all of the the South Lakes area. In July 2017 the Lake District was awarded UNESCO World Heritage Status. The Cedar Manor Hotel – boutique hotel within walking distance of Windermere town centre. The Rothay Manor Hotel – charming hotel in Ambleside village on the northern end of the lake. Macdonald Old England Hotel & Spa – luxury lakeside hotel in Bowness. 1 Park Road – a luxury bed and breakfast in the heart of Windermere village. Pet Friendly. Lindeth Fell – 5* luxury bed & breakfast in a tranquil location on the outskirts of bustling Bowness. Oakfold House – 4* bed & breakfast located in a quiet position between Bowness and Windermere village. Hillsdale – 4* townhouse B&B with parking in Ambleside village on the northern end of Windermere lake.